A hierarchical system of codes can be constructed with MAXQDA. The program offers an easy way to make use of the hierarchical structure. If you now want to assemble all the coded document locations that have been assigned a subcode of “success criteria” as well as any subcode of “ideal projection”, you could use the Complex Coding Query to search for overlaps between the two subcodes. This approach would, however, be very cumbersome, especially if you are dealing with still deeper code hierarchies or a large number of subcodes. MAXQDA now offers the convenient option including subcodes in a code search. To do this, select the Include subcodes option in the context menu. In the example, it would be sufficient to only activate the two upper codes and choose the Include subcodes option. Now all subcodes of the two activated codes are taken into account in the search for overlaps. 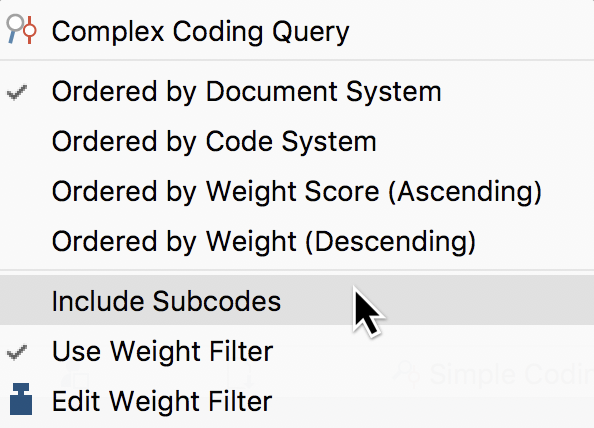 Whether the subcodes are included in the code search or not can be recognized in the context menu itself (by the marked or unmarked checkbox). It is also shown in the status bar, whether or not the subcodes (or “code children”) are included. If there is a checkmark on the symbol, the subcodes are included. Tip: You can also select the option directly in the status line by clicking on the icon – this acts as a switch and changes the setting. The option for subcodes also aplies to the simple search for codes: In this case it’s sufficient to activate an upper code in order to automatically display the coded segments of the non-activated subcodes in the “Retrieved Segments” window. But, as described, the search function’s full potential can be seen in the Complex Coding Query, in which several codes are combined with one another.